Vader Invasion: How many Vader do you have? Darth Vader, an icon and the soul of Starwars. Knowing or unknowing, Darth Vader had invaded us more than we know it. With the multitudes of merchandises created through out his 20 years reign, Starwars collectors will agree on that there have one or more Darth Vader related merchandise in their collections. That make me wonder just how many Darth Vader in their collections. 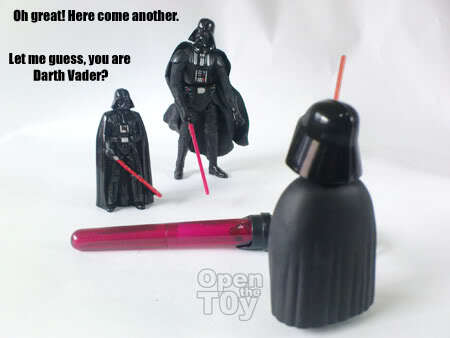 So I decided to find the answer and I hope fellow toy collectors who are reading this entry will join me on this quest. Create an entry on your blog with link to this entry and share with us in writing and photos on your Vader related collections. Leave a comment on this entry with your entry link so that I can add a link to your entry. To start the ball rolling, here's how Darth Vader invaded my collections. 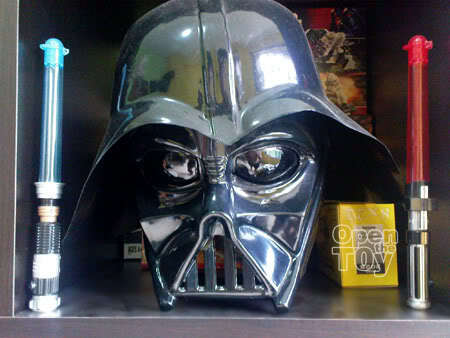 This is a cheap light plastic Darth Vader mask I bought about 10 year ago. Today it is sitting at a section of my cupboard along with some other toys and books. If my memory serve me well, it was on sales $5 during a clearance sales. 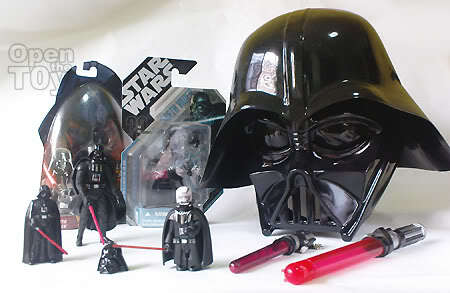 As for the Vader's lightsaber on the right, it was a liquid candy container. When I saw that, I bought off instantly together with another Jedi lightsaber(on the left). I don't really enjoy the liquid candy though...Who cares, I just want the saber for display. 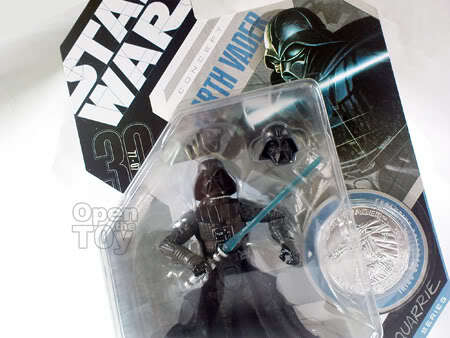 No.3 : Concept Darth Vader R.M'quarrie Signature Series. This is one of my favorite Darth Vader figure. It comes with 2 changeable heads and a Coin. I decided to keep this mint as I really like the card art. I got this vader as the cape is cloth. I didn't open this guy up as it was kept in my storage area. I dig him out to number my vaders. No.5 : Darth Vader from Empire Strike Back. 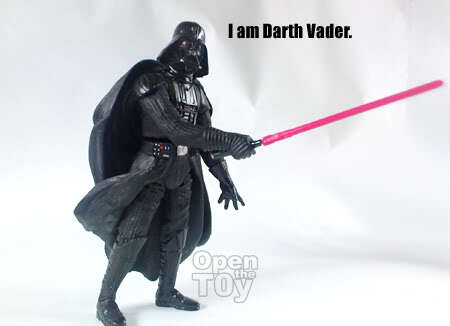 One thing about loose vader is that you can't remember where exactly you got it from as the packaging is being thrown away donkey years ago. As far as I can recall, this came in a blue packaging from Hasbro. Around the same time when they are selling Episode 2 period. The cape felt like soft rubbery and the lightsaber blade is attachable. The hand has a magnet to kinda do the force thingy. Pretty cool Vader and that's why I got it. No.6: Darth Vader from breakfast cereal. 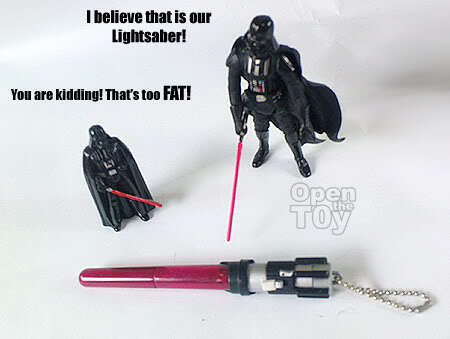 No.7: Tomy Darth Vader's lightsaber keychain. I remember getting this series from a Capsule Machine. Had a few try and finally got this precious. You can on the light by a switch but apparently it ran out of batteries. 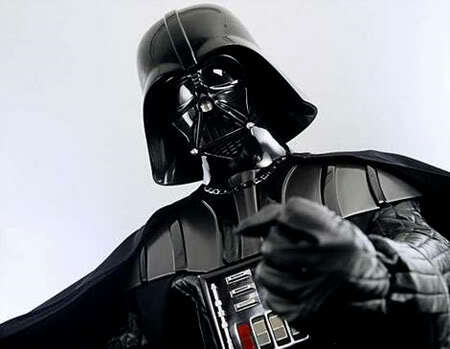 I felt in love with this Darth Vader when the series of Kubrick came out couples of years back. Why I fancy him? Simply because of this. holy cow, this is cool. 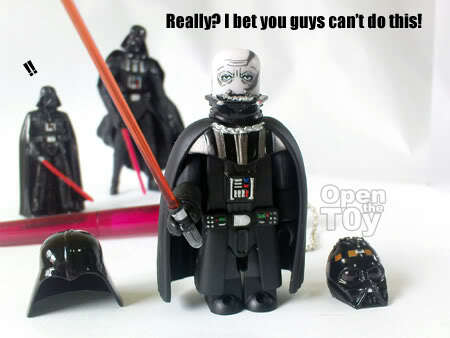 I'm going to dig up all my Darth Vader stuff and start shooting pictures! Okay, it's going to take me a few days to shoot pics and get posts, yes I said posts, but here's my Pre-Invasion post! I only have 1 vader lol and I think that's my only SW toy too. No problem Chunky. I have listed your link on the entry! Jcee join in anyhow. It may be the start for you. I have a mid 90s Kenner figure and a (broken) bank. Juliana why you sold your Starwars collection away? I bought a lego vader for my hudband and he still loves him very much. go check out leo he is cute in lego. 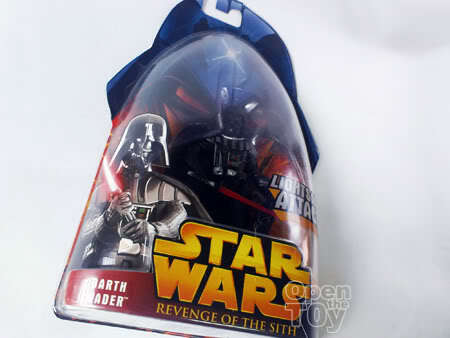 It was around the SW craze many years ago at the then Clarke Quay flea market. Back then I felt that I strayed from my X-Men collection so I sold them. I got those 3.75-inch figures loose w/complete accessories. I had DV, 2 Storm Troopers, Luke, Leia and some Micro Machines SW vehicles. Man, I have a ton of Vaders. Too bad I'm in the midst of moving places now and most of them are kept in boxes. 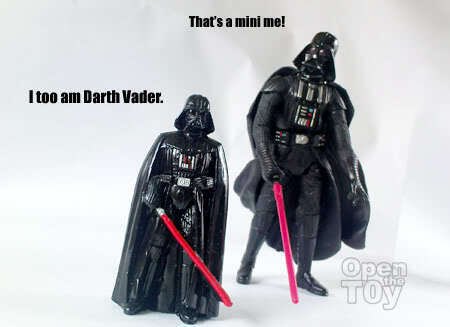 Think i got 2 Vaders, a 1/6 14inch tall custom i got built for me and a 1/144 which is less than 1cm tall. Will take some pics of them tomorrow, this is a cool event you got going and i'll join in. The only 2 vader i own, really surprised that i only had 2. Vader is powerful. Even you got it for your husband. 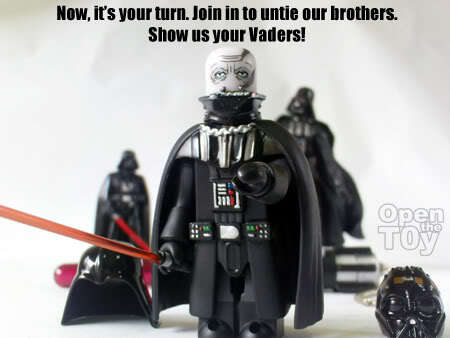 LOL Where the link to the lego vader? Darn. If I had read this about 6 hours ago I could have gathered all my vader stuff. 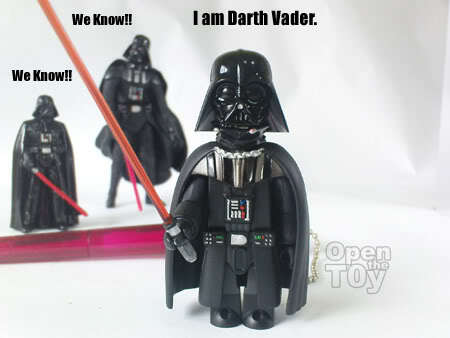 Unfortunately what few vader toys I have are scattered amongst 4 locations and I won't hit them all until next sunday. Wow! Really nice cool collection of dark Vader my friend. Thanks Dennis. You have any vader in your collections? That concept Vader remains one of the coolest figures Hasbro ever put out. Loved that series. Thanks Dan! Your entry has been added. Cool Video I must say.